As I shared in my last post, the beach at our hotel was really just large rocks, but we got the chance to visit sandy beaches on our boat day. We were given four options for our boat day. Full day at Mljet Island national park, a full day with Korcula island tour, and a half or full day exploring the Elafiti Islands with snorkeling. On the Mljet or Korcula island tours, we would have gone through Elafiti islands en-route, but we ended up choosing a half-day through Elafiti because J doesn’t like hiking and Mljet seemed like a lot of walking and history. We also wanted time to explore Old Town that afternoon. We didn’t have the best weather that day, so I think we definitely made the right choice not committing to a full day on the boat. The Elafiti islands are actually a small archipelago made up of 13 islands, of which only three are inhabited. We cruised around or swam by all the islands, but only stopped to walk around the ones that are inhabited. The first island we went to was Koločep/Kalamoto, which was historically known as a fisherman’s island, and lobster populations still love its shores. 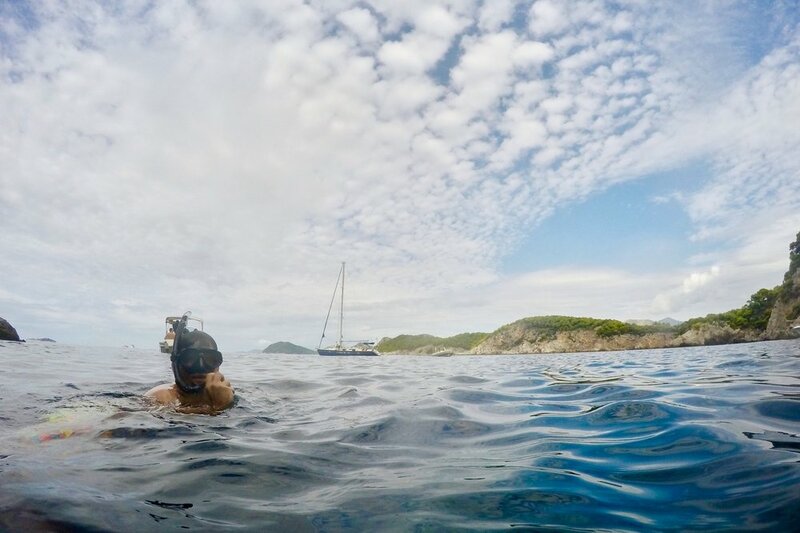 In hopes of seeing some of these lobsters, we stopped on the south side of the island to do some snorkeling. 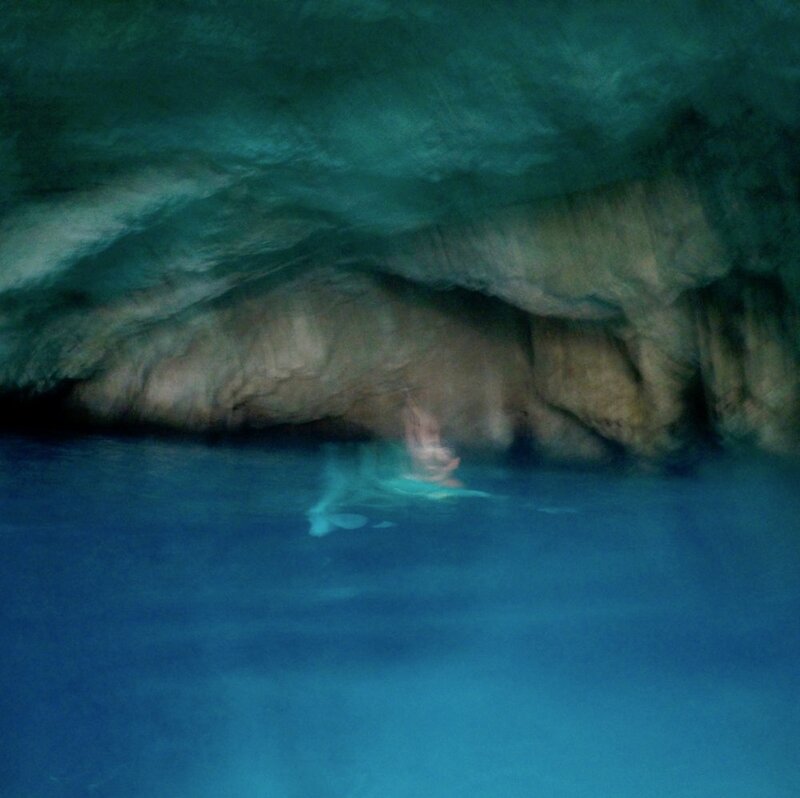 There are caves all around the island, but the Blue Cave is the best known. It is only accessible by swimming, and since we went during high tide, you had to go under water to swim in the entrance. Okay, like barely underwater - maybe only your mouth had to go underwater, the rest of your head was above it. The entrance is the center image above, just so you can see how much I was overreacting. Next, we went to the bay of Šunj on Lopud. Šunj is famous for its sandy beach. We anchored the boat and swam to shore to walk about a bit. After returning to the boat, we went around the island to stop for lunch. After checking out some shops (where I bought a red coral ring) and walking around Lopud Park, we stopped for some Aperol spritzes and pasta to share. Hashtag Spritz Life. Before heading back to the hotel, we stopped at the last inhabited Elafiti Island, Šipan. It is the largest of the Elafiti, and is known for all the different species of palm trees. But there are also olives, figs, vine, carob, almond, oranges and citrus plants that are cultivated on the island. It was adorable. 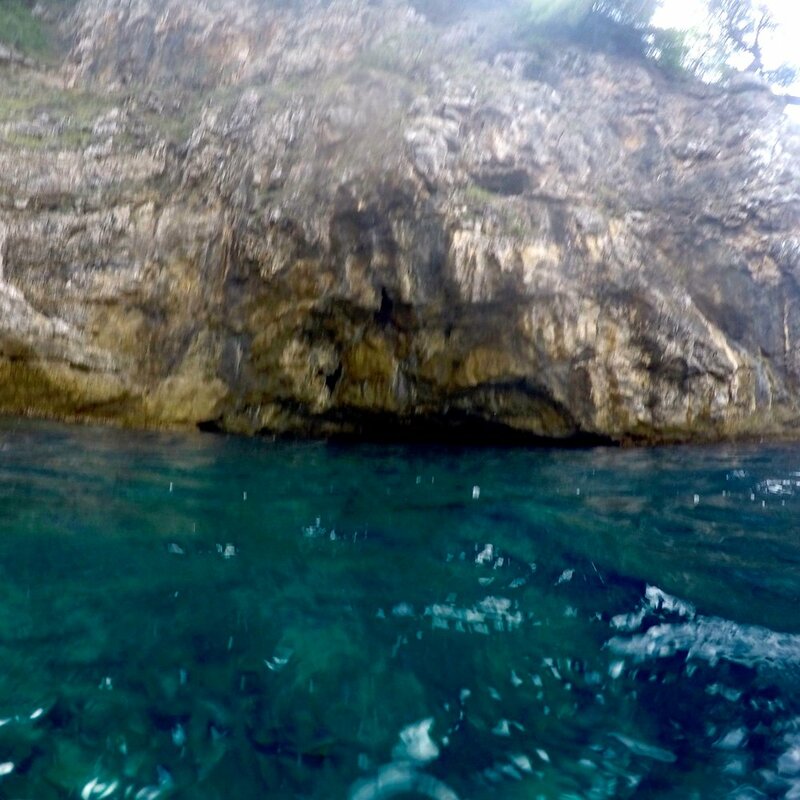 Our next excursion was a six-hour tour of the Pelješac Peninsula. I say six-hour to emphasize how long we were drinking. First, we stopped at the Mali Ston bay where we met a man whose family has been farming oysters and mussels in the bay for generations. We boarded his boat for a tour of the oyster farm/trays. We then went to his private island where he showed us traps with mature mussels and oysters, which he then pulled out of the ocean and carried to a picnic area with a grill. First, he gave us some homemade Mayberry grappa and shucked the oysters that he pulled from the bay just moments before. He served the oysters with a few lemon slices and they were absolutely perfect. They didn’t look or taste like any oysters I’d ever eaten in the states. The shells were very flat and iridescent and the oysters were delicate and perfectly briny. While he was preparing the mussels, we were offered a pitcher of his father’s homemade wine. Since he made it himself on the island, there were no artificial flavors or preservatives, and you could really taste the difference. It was earthy and delicious with very little tannins. Then, the best mussels I’ve ever had. I’ve always been iffy with mussels in restaurants, and now I realize that they were not even a little fresh. These mussels were so fresh that they needed very little. They were so simple – just white wine, olive oil, lemon slices, onions, and some parsley. After filling ourselves with seafood and liquor, we moved on to a winery. Vinrija Milos (or Milos Vineyard) in Ponikve is a family-owned vineyard and winery that basically checks all my boxes. 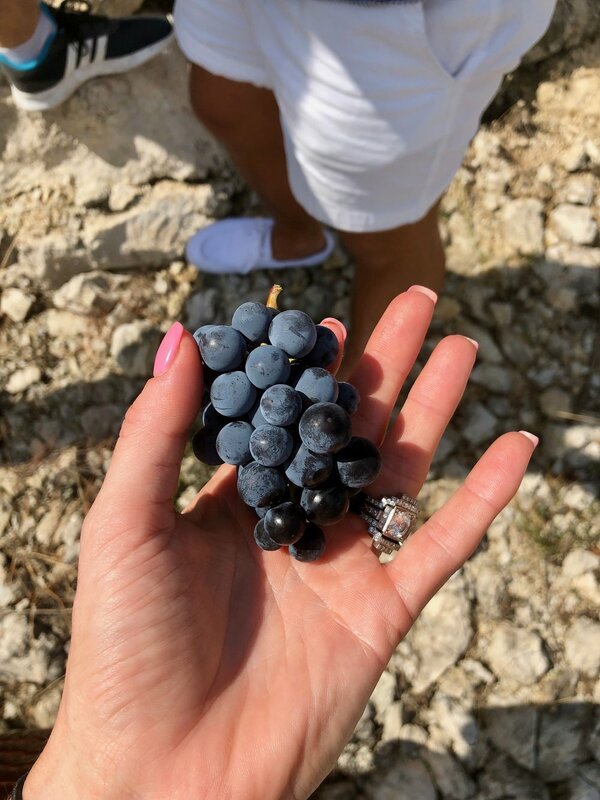 They grow Plavac Mali grapes, which is an ancient cross between Crljenak Kaštelanski (an ancestral zinfandel) and Dobričić, and is only grown in Croatia. The vineyard is beautiful, and all the vines are grown on very steep slopes – some as steep as 45 degrees – that are full of rocks and deeply grooved sedimentary soil. It was NOTHING like the vineyards we visited in Napa and Sonoma. The winery is committed to biodiversity and has begun introducing medicinal Mediterranean herbs that share their natural habitat with the Plavac Mali grapes. They plan to use herbs such as sage, rosemary, and St. John’s Wort to produce teas. The vineyards are also visited by rabbits, hawks, and ravens that love the rocky cliffs above the vineyards. WINE? BIODIVERSITY? FUN DIRT FACTS? TEAS!? I was sold and ordered a case of wine. Well, first we had a vineyard tour, where we got to try the grapes off the vine, and then a tasting with cheese and bread (yum). We also got to sample the vineyard’s olive oil. The olives are handpicked and cold pressed from 80% Oblica and 20% Pastrica. 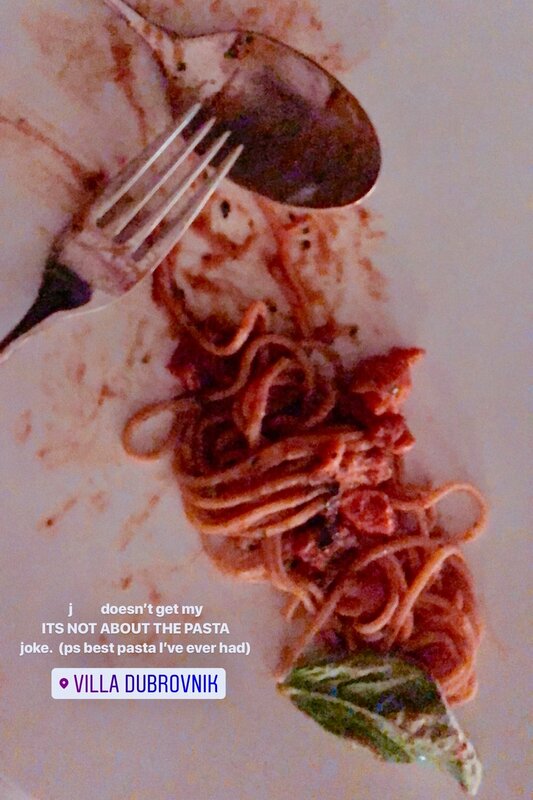 Like pasta, I learned that olive oil in America is just awful (also mayonnaise, for that matter - because eggs in the US are so terrible, and the other ingredient is olive oil). We were offered little shot glasses of olive oil at the vineyard, and I was initially disgusted, but the olive oil in Croatia (as well as Italy and France) was nothing like 99.9% of what is available in grocery stores here. It’s fruity, salty, bitter, fatty, and delightful. We also ordered two bottles of olive oil and I’ve been eating it with mozzarella and prosciutto as a pre-dinner snack at least three times a week. If you do want good olive oil from a grocery store, I highly suggest Cobram Estate. If you’re looking online, I suggest Brightland. Finally, we went to 360 Dubrovnik for dinner. First, I want to say that I did not intend to drink a bunch of wine, followed by more wine, followed by a Michelin-starred tasting menu. We were supposed to go out to dinner on our ‘leisure day’, but the schedule got messed up and I couldn’t change our reservation. 360 Dubrovnik is one of three (now five) Michelin starred restaurant in Croatia, and the only in Dubrovnik. They bill themselves as traditional Croatian cuisine framed by French techniques with a modern twist. It’s located right inside Old Town, but the entrance does not do the restaurant justice. As the hostess walks you up the flights of stairs to the top of the wall surrounding Old Town. It’s an incredible view that the food lives up to. We were greeted with a glass of Champage, which would have been divine if we had not been drinking all day. I drank it any way. For the amuse bouche we were presented with a trio of small bites. Herb Biscuit with whipped cheese; crispy Jerusalem artichoke leaf topped with black pork meat and chili mayo; and Aubergine puree coated in liquid charcoal. Before receiving our first official course, we got a basket of house-made breads with a seaweed butter and an olive oil butter – both filled with umami. I could eat homemade bread and butter every day for the rest of my life. Our first course of the tasting menu was raw prawns with pumpkin cream, hazelnut oil, carpione sauce, and pumpkin seeds; followed by mackerel with bonito dressing, chimichurri, celery purée, and cucumber. We then received octopus with fennel, lime ravioli, and dark fish soup. Our last savory dish was sea bass with cream of garlic and potatoes, cuttlefish, lemon cream, and green sauce. At this point, I was beyond stuffed, but dessert was chocolate & coffee ganache on a bed of cocoa nibs crumble with mascarpone cream and vanilla ice cream, so I obviously kept eating. We were then given more chocolate with our bill, and I began to wonder how I was going to walk back to our hotel. Funnily enough as we were walking back, we heard a guy behind us explain “how are you nervous here, you walk around uptown Charlotte by yourself.” Sure enough, they were another couple from Charlotte on their honeymoon. There was also a girl from Duke Law in our hotel and an older couple from Germany with a daughter at Duke who we met at the bay of Šunj. It’s a small world. Overall, our stay in Croatia was amazing, and it is easily my favorite country that I’ve every travelled to. I can’t wait to go back and explore the other cities. If you have a chance to go, don’t think twice! Get there as fast as you can! If you have any other questions – leave them in the comments! I had been trying to get my husband to go to Croatia for years. YEARS! Even before the inaugural season of Below Deck Med. Initially, he wanted to swap Croatia out of our trip in favor of Greece. Our travel agent said we should swap Croatia out in favor of Greece. Multiple people told me how much they loved Greece. NO! This was my chance to finally visit to Croatia and nobody was talking me out of it. The promise of fresh oysters, lots of wine, and no ferries was enough to get my husband on board. There are lots of ways to get to Croatia, but I wouldn’t recommend the way we did it. We went straight from a wedding in Ann Arbour, MI to our honeymoon, so we had to fly from Detroit to Chicago, go through security again (which meant throwing away the drinks I already bought for the long flight), Chicago to Dublin, where the customs process was far more calm and civilized than TSA at O’Hare, then our final flight from Dublin to Dubrovnik, which my luggage didn’t make. I would recommend the direct(!) flight from Philadelphia to Dubrovnik, which is new in 2019. There is also a direct flight from Toronto to Zagreb. For indirect flights, try to pick ones with stops in London, Munich, or Frankfurt. A lot of people fly into Dubrovnik via Rome, which I do not recommend. The Rome airport is notorious for theft. At least when I finally got my luggage, the contents were undisturbed. I couldn’t say as much for the person ahead of me in the lost luggage line who had her shoes and jewelry case stolen from her checked bag in the Rome airport. While in Croatia, we stayed at Villa Dubrovnik, which was my favorite hotel of the trip based on hospitality, the hotel restaurants, and the “beach”. It was a short drive from the airport and within walking distance of Old Town, aka King’s Landing. Villa Dubrovnik is a beautiful boutique hotel nestled into the rocky shore of Dubrovnik with gorgeous water views from every room, restaurant, and lounge area. It’s so nestled into the rocky cliffs, that you actually have to take an elevator from the street down to the hotel. The people who work at the hotel are so kind and welcoming. Every time we walked by the lobby, we were greeted by name and asked if we needed anything. We stayed up far too late at the wedding the night before leaving and I barely slept an hour on the plane, even after taking two Emergen-Zzz, so I was especially grumpy when my bag was lost. But they had chilled champagne waiting on our patio and immediately took over the process of locating my luggage – contacting the airport and airline – quickly making all my worries melt away. After checking in, we went to have our first meal. Our favorite restaurant at the hotel was Restaurant Pjerin. Every night for dinner, we sat at a small table at the edge of the patio, under the bright stars, listening to the rustling of the Scots Pines and the waves crashing in the ocean. The first night, we had their tasting menu, which was easily our best meal at the hotel, and maybe of our entire time in the city. 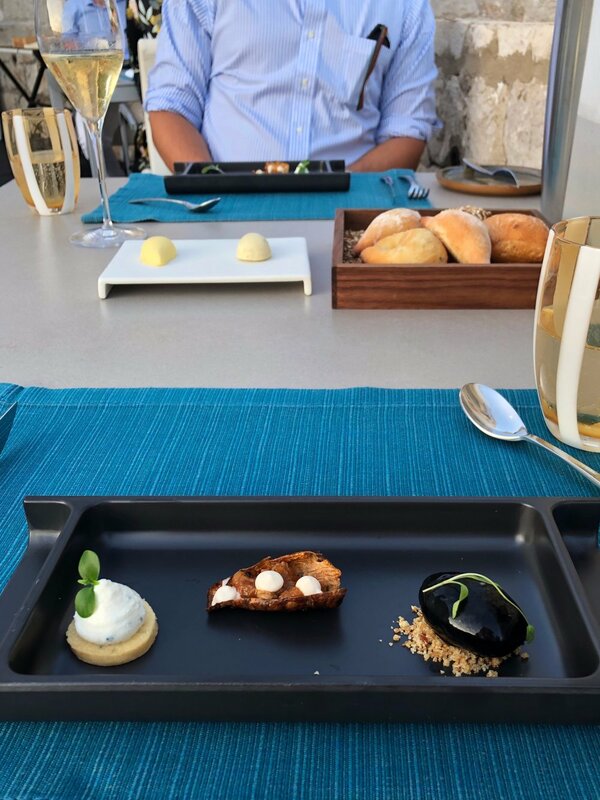 Every meal began with a small amuse bouche, and I wish I wrote down what they all were because they were the most delicious little bites. Everything was amazing, but oh.my.gosh I was immediately hooked on the lobster pasta. I legitimately ate it every day we were there. I also learned throughout this entire trip that homemade pasta is just so much better than dried, store-bought. While I ate lobster pasta every night, J tried their veal and got the sea bass again (both delicious). Restaurant Pjerin was also where we had breakfast every morning. It was included in our stay, but instead of a little buffet, they treated it like a proper meal. We could sit down, read the paper, and order as much off the menu as we pleased, and still didn’t have to pay a chit. Instead of seeming annoyed that we stayed so long for a meal where they wouldn’t get any tip, the wait staff seemed generally concerned if we didn’t order more food or finish everything on our plate. Smoothies, omelets, poached eggs, pastries, fruit... it all kept coming, and it was all amazing. The other restaurant at Villa Dubrovnik is the Al Fresco Bar Giardino, which was open for lunch. There was also a Proscuitto and Wine bar, but it was not open during our stay. The Al Fresco Bar Giardino had a variety of dishes, but we couldn’t be convinced to eat anything but their seafood. It was so fresh and so briny, thanks to the Adriatic. It is easily the best seafood I’ve ever had. We would typically get their cold platter for two, which consisted of oysters with raspberry vingoinette, “knežev dvor” (octopus, squid, cuttlefish, shrimp and crunchy vegetables), and tuna tartar. You could also order food from the AL Fresco Bar Giardino down at the “beach” and pool. At the beach, oysters and local Croatian tuna were our go-to – Tuna Niçoise salad for me and Tuna Wrap for J. The pool was lovely (and heated), but we stayed by the beach. Beaches in Dubrovnik aren’t your typical beaches. There is no sand, just large rocks with more rocks in the ocean. But it is just as relaxing and, I personally think, more fun. Each rock was typically big enough for two to three chairs, which created privacy and prevented overcrowding. 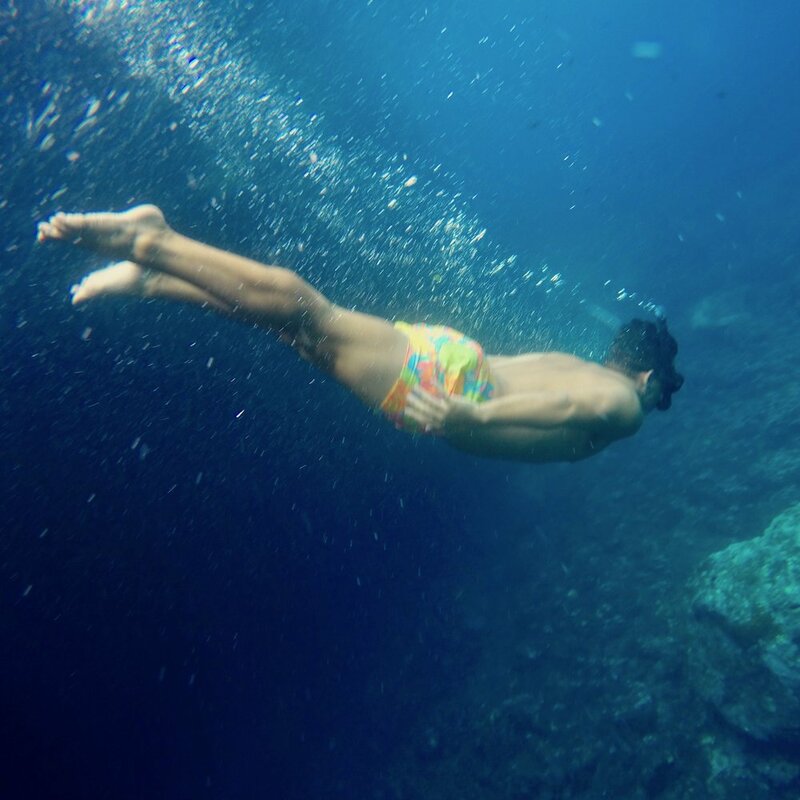 You could go from eating oysters to snorkeling with the cutest little fish by moving two inches. 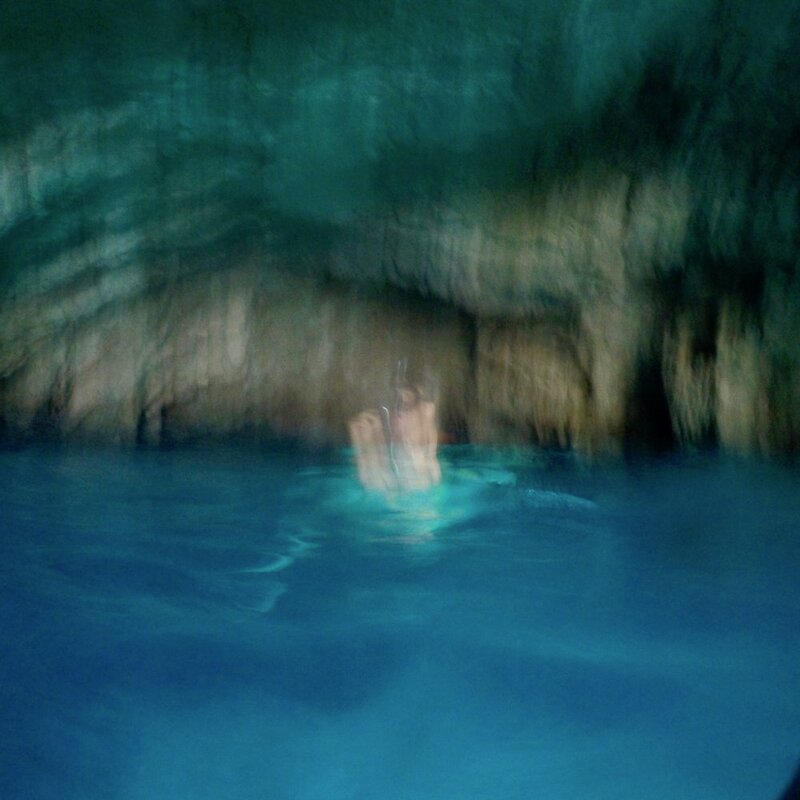 I thought I would hate that you had to swim in deep water, but the water is so clear you could see everything – all the way to the ocean floor – which was gorgeous. Plus you don’t get sand in everything you own. They are part of the EU and Euros are accepted in some places, but the official currency is Croatian Kunas. I chose to take out kuna (kn) from an ATM and use those the entire time. One USD is typically equal to six or seven kn. One Euro is typically equal to seven to eight kn. Gratuities are not mandatory and it is solely at your discretion. For drivers: anything is appreciated for the airport transfers, but €10 - €15 (or 75-115 kn) is appropriate for a half day of service, and €15 - €20 (115-150 kn) for a full-day. Tour guides: they recommend €12- €18 (90-130 kn) for a half day and €18 - €30 (90-225 kn) for a full day. Boat Captains should be tipped €25 - €35 (185-250 kn). 10% is a sufficient tip at formal restaurants, but you can just round up the bill at cafés and bars. Uber is new to the country and rides were not easily available when we were there. Taxis were easy to find around the entrance to Old Town and most hotels can arrange for taxis or private car services. Multiple cruise ships stop in Old Town every day and thousands of tourists come aboard from these ships. For the best experience, go early in the day or later in the evening to avoid the masses. If you have any questions about our stay, let me know in the comments! I've always known I wanted to get married in the fall, so when the fiancé proposed in January I knew I had to find a location fast. Now that everyone has jumped on the fall wedding bandwagon, all Saturdays in September are in the top 10 wedding dates of 2018. What I didn't realize was you need to buy your dress 8 months before your wedding. So almost immediately after getting engaged, I went to Raleigh, scoped out some bridal boutiques, and made an appointment at Coastal Knot. I love Raleigh and decided to make a day of dress shopping. After picking my mom up from the airport (yes, I was late - but in my defense, her flight took off late and somehow landed early) we headed to the southern point of the Triangle and grabbed coffee and macarons at Lucettegrace. We then headed over to Poole's for a delicious brunch. I sipped on Rose all Day and fell in love with their smoked salmon and avocado toast. After deciding that it probably wasn’t a great idea to get a third drink, we headed over to Cameron village and popped into a few of my favorite stores - bevello, the impeccable pig, and Charlotte’s. Once we killed a sufficient amount of time, we walked over to Coastal Knot to find my dress! 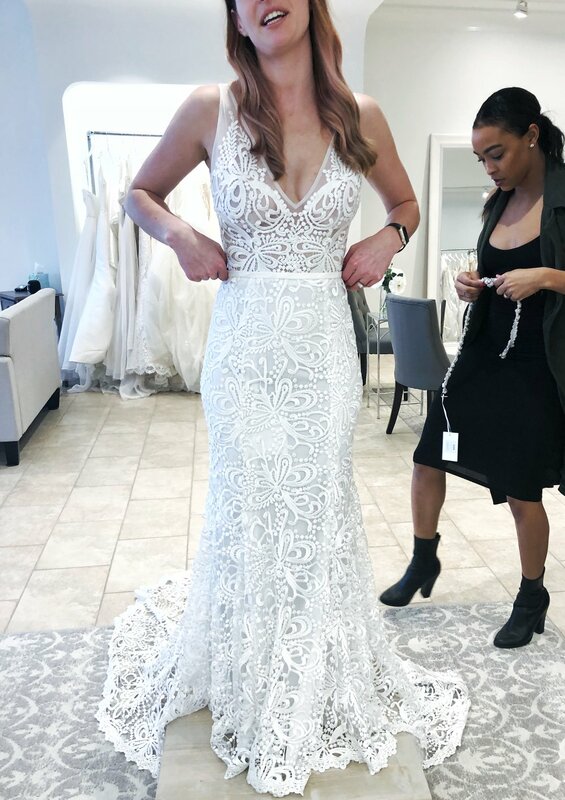 The first dress I tried on was Lorelei by Hayley Paige. It was beautiful and pink and ate me alive. The pink color and the sleeves completely washed me out and I took it off before we could take pictures. I knew every dress I tried on would have to be clipped, but I didn't think about parts that couldn't be clipped. I could not get my head around the baggy illusion sleeves on the sample. This was my favorite dress going into the appointment. I loved the color and sparkle on top, but I worried the fabric was too thick and the skirt had a life of its own. We are getting married in September, but September in South Carolina is no joke. Humidity is very real and sometimes it feels like the air is so thick that its weighing you down. Is that stopping me from having a formal wedding and asking men to wear tuxes? Absolutely not. So maybe I can suffer the heat in a heavy ball gown. Plus, the blue and coral-esque beading is just perfect for our waterside ceremony. Arlo made me question everything I thought about ballgowns. It was almost as overdramatic as I am, but it was so damn heavy. So when they pulled this dress I was receptive... aaaand then she told me it was the most expensive dress in the store. It was still technically within my budget, and I wanted to see what a fit & flare dress looked like, so I tried it on. 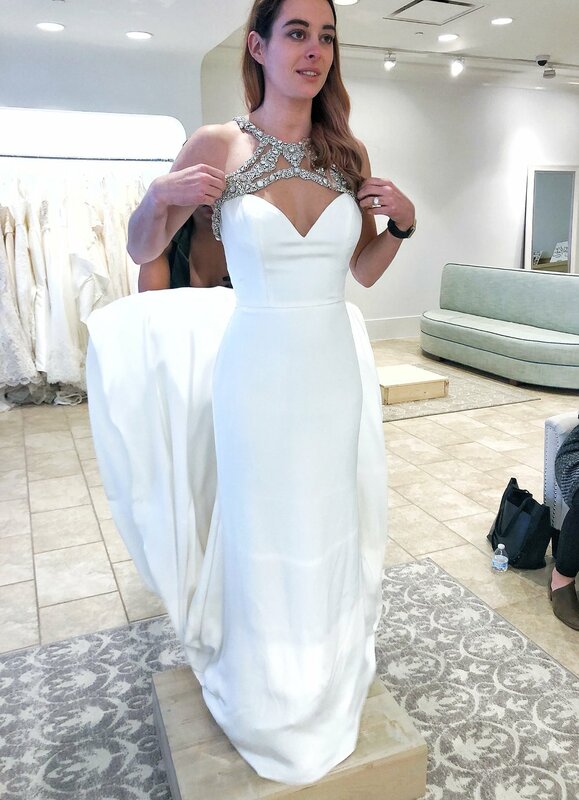 I love the silhouette and illusion necklace, but what I really loved about this dress was how easily I could move around in it. I was concerned that the body was too plain, but I felt like the bling up top made up for that. However, I want to wear my hair down, so the gorgeous bling at the top would be at least partially covered. I tried it on with a full skirt and belt (the same belt pictured on dress 05) and that really made the dress pop. But did it pop enough? Hearing my need for sparkle, we pulled this dress off the mannequin. It was completely covered in sequins and shimmered with every move. I loved the low back, but I felt that the waist was far too low. It didn't cinch at the smallest part of my waist and made my torso look longer than it actually is. You can see that my friend was feeling this dress as much as I was. At this point I was willing to step away from everything I thought I loved. Hayley Paige, ballgowns, sparkles, everything. I went into the appointment thinking that's all I wanted, and this dress had none of that. I ended up really liking this dress. The lace pattern was beautiful, it fit the waterside venue, and I could actually move around in it. My main concern with this dress was that it may not be formal enough for our black-tie optional wedding. I went back to the ball gowns and my serious love of Hayley Paige for this last dress. You can't quite see in this photo, but there's actually sparkle netting under the tulle. I was still concerned that the sparkle was still too subtle and the dress was somewhat plain. Adding the belt (also by the beautiful Hayley Paige) helped a ton, but was it enough to be my dress? Bring snacks. Finding your dress is exhausting and hanger is very very real. Bring a married friend. Having a friend who has found their own dress will know what to expect and can ask questions that you wouldn't even think of. Let your friends pick out one or two dresses for you to try on. I went into this thinking I knew exactly what I wanted, and when a few of them didn't work out I didn't know what to do. I let my friends pick out dresses they thought would look good on me, and it got me out of my funk! Don't rush it. Dresses are expensive and you will be looking at pictures of your dress for the rest of your life. I was lucky enough to be the only appointment in the store that afternoon and was able to try on dresses for 3 hours. If I had to stay in the one hour appointment window, I would not have found my dress. but thats okay. You can always come back or go to more stores. So which dress do you think I chose? I can honestly say that I did purchase something pictured in this post! So I kind of hate when people say they're "sweating for the wedding" because I feel like it implies people creating unhealthy goals for their big day or developing healthy habits that'll be given up once they're no longer a bride. 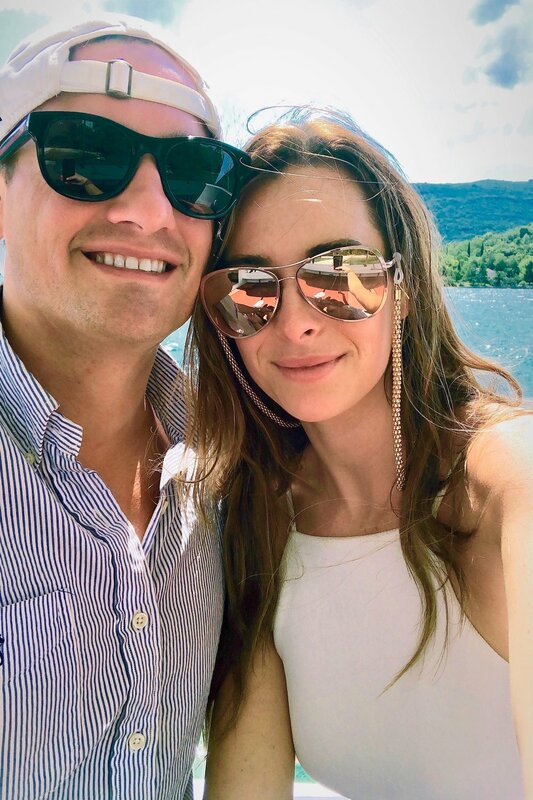 But I know getting married can be the motivation needed to create healthy habits that will be continued long after the wedding & that's what this post is about! I played just about every sport growing up and was always playing on some team all the way through High School. 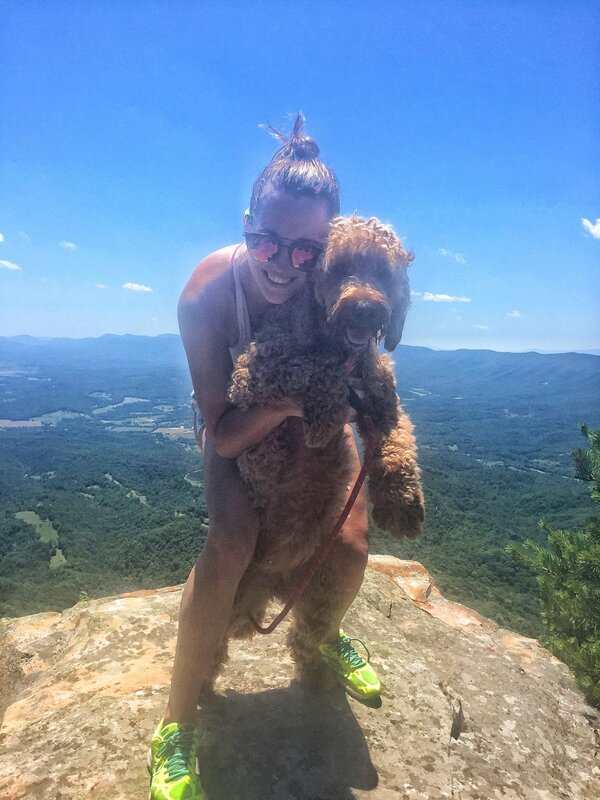 I played one year of college field hockey until some health issues made it too difficult. I did yoga for 6 days a week until that also became too difficult. After getting that sorted out, I did BBG for a bit until starting CrossFit. I joined CrossFit in January 2017, but didn't start going regularly until April. In the summer, when I had literally nothing better to do (cleaning doesn't count) and Dixie refused to be outside for more than 30 minutes (no words can describe her level of diva - she's like Mariah Carey on steroids), I went to CrossFit 6 or 7 days days a week. I definitely saw a ton of improvement, but only for 6 months. After that, I wasn't getting faster or stronger, I wasn't burning fat, and I wasn't feeling my best. I also was in no way willing to take it seriously enough to adjust my diet or sleep schedule for further improvements. And why should I? If I want to have a cupcake for breakfast, or god forbid, eat breakfast instead of this crazy fasting fad thats going on, I'm going find my favorite Kate Spade plates and eat frickin' cake for breakfast. Okay, also, if I'm being totally honest... I also don't care about being "functionally" fit. I'd rather go for more ‘fashionably’ fit vibe. Less donuts&deadlifts, more shopping-is-my-cardio. HOWEVER, if you're in a place where your fitness goals seem unattainable and need a serious jumpstart to your fitness, I highly recommend going to CrossFit 4-6 times a week for 6 to 8 weeks. You will be magnificently sore, but after those 6/8 weeks, you will be able to do any workout class & do it well enough to get the maximum benefits from that class. I stopped going to CrossFit and paused my membership for two months to reevaluate my fitness goals. After I got engaged, I cancelled my membership for good. I think there are tremendous benefits to lifting weights and I love the olympic lifts, I couldn't justify the cost of a CrossFit membership just to have access to a barbell. Especially when i realized how much veils cost. Like WHAT!? To satisfy my Doctors' emphatic insistence that I work with heavy weights, I downloaded Madalin Giorgietta's work out guide - Body by MG. Maddy is a former BBG girl who didn't enjoy the cardio or plyometric movements in BBG, so she created a guide that is entirely lifting. Plus, all the movements can be done or easily modified for my apartment gym. It's a great guide to building muscle where you want it (🍑) and toning where you want to be defined, but not bulky (💪). I highly recommend it for anyone who wants to get in shape while avoiding cardio entirely. One issue that I had with CrossFit was how much standing around there was. If I'm going to spend an hour of my time working out, I want to be working every single minute of that hour. Enter OrangeTheory, conveniently located across the street from my office (and dangerously, next to Monkees). The moment you walk in the door, you are working and your heart rate is up. I also love how much cardio is incorporated! You're time in OT is divided between the floor (for weighted and body weight movements), the rowing machine, and the treadmill. I've never been able to run on the treadmill, but somehow I can at OT. I don't know how they do it. I don't know if the music or upbeat instructors, but its great. Plus, I love being able to check my heart rate and seeing if I need to step it up or take a breath. You gotta get those splat points! The only downside to OrangeTheory is its popularity. I have to book my classes a week in advance, and some times, I still have to sign up for the waitlist! On days where I know that I'm not getting off the waitlist, I use Tone It Up. I've been using their recipes and meal planning guides every now and then, but I love their "5 Daily Moves" concept and work out videos. Even on my most exhausted mornings, I can drag my but out of bed for some coffee and 5DMs. Maybe I get a video done, maybe I don't. Either way is okay with me. The 5DMs are certainly enough to get my day started & they're FREE! I like to balance all of this with maintaining a healthy lifestyle & spending time outdoors, which is a little less appealing in the winter. I got my fill of winter & am not VERY ready for spring. What are your go to work outs? Whenever it's chilly, windy, rainy, or the weekend, I crave Indian food. I'm basically always craving Indian food. There was a place by my old apartment in Baltimore with the best buffet on the weekends. For under $15, I could fill up on as much chicken tikka masala, vegetable pakora, tandoori chicken, garlic naan, vegetable biryani, kheer, and Nepali tea as humanly possible. It was a dream. When we moved to Virginia, we had a Staunton Dinner Club that would drive 45 mins to get Indian food. For a small town in the mountains that isn't really close to anything, Staunton has some surprisingly great chefs and frickin delicious food. After the move to North Carolina, I started making some diet changes. There was no Kenny’s, so my fried chicken intake decreased significantly (if you ever drive on 81 between Staunton and Roanoke, stop at Kenny’s in Lexington, you won’t regret it). I stopped frequenting Indian restaurants because we couldn’t find one we liked as much. Making our favorites at home was the next best thing, but what to do about the rice? As much as I love cooking, rice has always been a challenge to me. It’s always to sticky or steamed, and I may have caused a few microwave fires via ‘microwaveable’ rice in my day. Something has to soak up all that yummy sauce. No ancient grain seemed to do the trick and, I'm sorry, but cauliflower rice is flavorless and stupid. But regular cauliflower? That can be crisped and roasted and spiced to perfection. So I went with a roasted cauliflower as a base and then started experimenting with other veggies. I’m not a fan of potatoes, and chickpeas aren't my favorite. But golden raisins are amazing! I finally settled on carrots, cauliflower, peas, onions, and golden raisins, but feel free to substitute any of those with your preferred vegetables! So customize as you like & enjoy some paleo-friendly butter chicken! 02. toss carrots (and any other veggies that take a while to cook) with oil and salt and roast for 10 minutes. 03. if making your own sauce, go ahead and make it now - my recipe is below. If using canned sauce, add it to a large heavy pot and bring to a simmer. In a separate pan, sear chicken on both sides. 04. add crisped up chicken to the sauce, bring to a steady simmer, lower heat, and cover. 05. add the other veggies, lemon, and at least 1 teaspoon of garam masala to the carrots. stir and return to the oven. 06. Once the veggies are soft, remove from the oven. Add any extra seasoning you want. Serve chicken on top of veggies with extra sauce. Enjoy. 01. Heat butter/ghee/oil in a large heavy pot over medium heat. 02. Add onion, tomato paste, garlic, and ginger and cook, stirring often, until tomato paste has darkened and onion is soft, about 5 minutes. 03. Add garam masala and stir to let flavors deepen, about 4 minutes. 04. Add tomatoes with juices, crushing them with your hands as you add them or using an immersion blender. Bring to a boil, reduce heat, and simmer, stirring often and scraping up browned bits from bottom of pot. 05. Add coconut milk and let simmer, stirring occasionally. Taste sauce during this time and add optional spices to taste. This is where you can customize the sauce to your personal preference and make it as spicy as you like. In total, let the sauce simmer for 30-40 minutes. 06. Freeze whatever sauce you don't immediately use.